One of the biggest rewards for just being an Oscar nominee is the extra box office that kind of recognition gets you. For many films, a Best Picture nomination can earn it up to $50 million over what it might have otherwise made. This first weekend after the announcement of the Oscar nominations sees all five Best Picture nominees in theaters to varying degrees, along with five new wide releases contending for the four-day President's Day weekend crown. The films most likely to benefit from Oscar attention are, of course, the ones that didn't get that much in the first place. The two that fit the bill here are Gosford Park and In the Bedroom, which enter this weekend both at around $20 million earned. These are respectable numbers for both, considering their subject matter and relative lack of big names, but those totals are about to start getting a lot bigger. The most recent analogue is The Cider House Rules, which in 1999, went from a $20 million earner to $57 million as a result of a surprise Best Picture nomination. Neither of those is quite that much of a surprise, though both were earning a slow steady $2 million per week before nominations were announced. The weekend after its nomination, Cider House Rules jumped from $1.5 million to $3.4 and kept that ballpark figure for the next month and a half. Of the two, the more accessible film is probably In the Bedroom; due mostly to Gosford Park's sometimes oppressively British accents and attitudes. In the Bedroom also has an edge over Gosford Park in earning potential by way of an expansion to 1,002 venues, while Gosford Park stands basically pat at 837. With five high profile nominations, In the Bedroom should be able to earn about $5 million over the four-day weekend. Gosford Park should sit slightly below this, at $3-4 million even though it captured seven nominations, including two in the Best Supporting Actress category. A Beautiful Mind and The Lord of the Rings: Fellowship of the Ring both were expected nominees for Best Picture, which makes it somewhat surprising that both see drops in venues even with five new releases. The effect for movies that are already in wide release and have been for sometime is much smaller than those that chose this time to release wide. The core audience has already come and gone and the general effect is such that the weekly box office decay halts for a time, rather than increases. Taking into account the four-day weekend, A Beautiful Mind should increase slightly to $7 million while The Lord of the Rings may end up at close to $5 million. After 13 nominations, a $300 million plus total box office tally for The Lord of the Rings is all but achieved. The fifth Best picture nominee, Moulin Rouge, is still in 11 venues, but is a non-factor at the box office. Fifty thousand dollars may be a realistic total for it this weekend, as anyone who really wants to see it can easily find the DVD. The five new releases this weekend are certainly no after thoughts; three of them will definitely battle for the role of number one film this weekend. 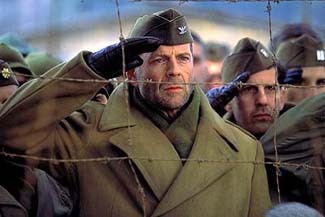 Hart's War, starring Bruce Willis, has the early lead, with an action packed trailer and a WW II setting. Something of a cross between The Great Escape and Rules of Engagement, this film tells the story of an escape attempt from a German POW camp but bracketed by a court-martial case occurring inside it. Ads have been careful to represent only the escape portion of the film, which leads to one of my puzzling thoughts about the film's chances of success; why make a portion of a film if you're going to try and hide it? Obviously you're concerned it doesn't work. Nonetheless, this does not matter for opening weekend, and the recent success of war films like Enemy at the Gates (a phenomenal triumph considering its cast and subject) and Black Hawk Down lead me to believe that a victory is likely for Hart's War; around $21 million over four days would not surprise me. John Q stars Best Actor nominee Denzel Washington; it's a rather unique situation to have a film opening up for a nominated actor directly after the nomination announcements, especially one with this of a high profile. A story of a father pushed too far by the medical system. This conjures up nasty images of films like Mad City and Desperate Measures. It would have a tough fight to be as bad as either of those two films, but the ads have certain ham-fistedness to them. I wonder if the idea of hostage taking is just too repellent to make for a sympathetic character no matter what the circumstances. Denzel's name should push this to $15 million for Friday through Monday but I would expect that to be a maximum take. Britney Spears hopes to not fall into the same crevasse that swallowed Mariah Carey earlier this fall as she launches Crossroads, a coming-of-age road movie for the Teen Beat set. This film doesn't have the obvious semi-autobiographical detail that made Glitter such an unintentional comedy and, shock of shocks, actually looks like it might be respectable. Will it attract a single male viewer? Well, most film critics are male. Then again, A Walk to Remember has had recent success with essentially the same audience. The biggest question is how large Britney-mania still is for those 12-17 year olds out there. $9 million for the weekend should be enough to satisfy backers of this film. Super Troopers, a quasi-independent comedy, has gone to the unusual step of putting its first 11 minutes online. This isn't unique in itself; the starts of Memento and Chicken Run have also been found on the web, used as marketing tools. I personally found this small portion of the movie to be a little flat, but there is definitely the basis for a successful comedy lurking in the clip. Hoping not to conjure up the image of the Police Academy movies, it almost seems to be courting cult status before it opens. Released by the Searchlight arm of Fox into 1,778 venues, it could definitely become a factor in the box office this weekend. $6 million would be a reasonable total to expect. Nothing is more depressing that a terrible looking children's film; it's doubly so when it comes from the supposed masters of the genre, Disney. Peter Pan, Return to Neverland looks like it never should have left the direct to video track; cheap looking animation and almost impossible hokey voice acting make this one look like a terrible, terrible mistake. The short life of this film in theaters probably will not reflect on its success as a sell-through title though, once it does hit video and can be bundled with the original animated classic.